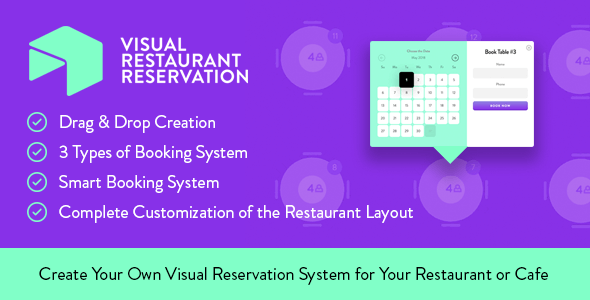 Create your own visual reservation system for your restaurant or cafe. With this plugin, you have an opportunity to create tables and seats by yourself on our grid, which is the main feature and is great. With the help of Drag & Drop method, you will be able to drag different kinds of tables on the grid of your restaurant and manage to count the maximum number of seats at each table as well as the number of tables. The visitors to your restaurant will decide what kind of table shape they prefer and then they will choose the table location in relation to the other tables on the grid. We are completely sure, that this way, the customers of your restaurant will be able to more quickly choose to come to your restaurant and form a positive impression about your website and your restaurant as a whole.